Tenkara, simple fly fishing method from Japan, uses only a telescopic tenkara rod, tenkara line and tenkara fly: George Elliott Gregory, first mention of tenkara? George Elliott Gregory, first mention of tenkara? Following my post on the first record of tenkara by Sir Ernest Satow, I received a response from Kevin Kelleher, author of the book Tenkara: Radically Simple, Ultralight Fly Fishing. I post his response below, and a few of my remarks on the bottom of this post. I should have made it more clear on my post that Gregory’s writing could be of tenkara. However, as Gregory’s descriptions are vague and not very detailed (he does not mention where he saw it, nor what fish was being caught), it is difficult to conclude whether he was observing tenkara or a different method of fishing. Satow’s writing, on the other hand, is certainly describing tenkara and for this reason Japanese scholars give credit to Mr. Satow for the first record of tenkara. The most interesting thing, regardless of who first observed tenkara, was the fact that the method was likely practiced in Japan for a few hundred years, yet the first records appeared less than one year apart. Though likely no one can prove unequivocally the first English reference to tenkara, I think you dismiss the discovery of George Elliott Gregory’s 1877 description in the Transactions of the Asiatic Society of Japan too easily. Let me defend. First, Mr. Gregory’s report to the Society was in his own words “a thorough consideration of the subject of the fisheries of this country,” and includes a broad if not comprehensive description of at least 20 fresh water fishing techniques from hand line and net, to trap and cormorant fishing, in “lakes, rivers, and preserves.” One would anticipate that a “thorough” report to an academic society cataloguing fishing techniques in the “preserves” might contain an early reference to tenkara and Mr. Gregory states he has been studying the subject “for some years” in many different parts of Japan. Second, the length of the rod in question is described as being between the 21-foot koi-tsuri-sao, and the 3 ½ foot haze zao, which at least fits the bill. More importantly, Gregory describes the rod in question as “a simple bamboo rod.” This resonates with my thinking on early tenkara rods, and Gregory himself contrasts this with multi-sectioned rods, lacquered and bound with silk found on other waters, and known to be used in Ayu fishing. Further, Gregory calls both the rod and the fly it casts, Ke-bari. The undeniable explanation of the action of the kebari (the fly) seals the deal for me. Gregory describes the wings (sic. Hackle) as being rough and rigid when compared to European flies and made so they are able to “resist the pressure of the rapid streams of the country [so they do not] collapse and thus cause the artificial fly to lose all similitude to the real insect.” Surely this is a reference to the traditional tenkara fly. Mr. Gregory’s specific reference to “the rapid streams of the country” makes the description unlikely an Ayu fishing reference, which was practiced in larger rivers nearer urban areas. Later in his report he spends several pages on a translated work, describing the cormorant fishing for Ayu including recipes, implying he likely knew the difference. In summary, Gregory’s description is a scholarly report of a fishing technique using a medium sized, simple, bamboo rod, fishing a kebari, whose hackle is designed to resist the high gradients, of the rapid streams of the country. Pretty convincing, I think. (As an aside, Gregory presented this report to an open meeting of the Society, and since Sato was a founding member, would very likely have been in the room at its reading.) In the end though, it will be admitted, that neither Sato or Gregory were anglers, hence we shall be forever dissatisfied. As I said in Tenkara, the origins will likely remain a mountain mystery, which suits me just fine. More importantly, the friendly banter between tenkara enthusiasts in this uniquely open community should continue, God willing, as long as clear mountains streams dance with fish. 1) Gregory chose to describe 5 methods: koi-tsuri-zao, ka-bari, nagashi-bari, dzudzugo and te-zuri. He writes ka-bari, not ke-bari. Ka is the word for mosquito, and is still used to describe the flies used in ayu fishing. 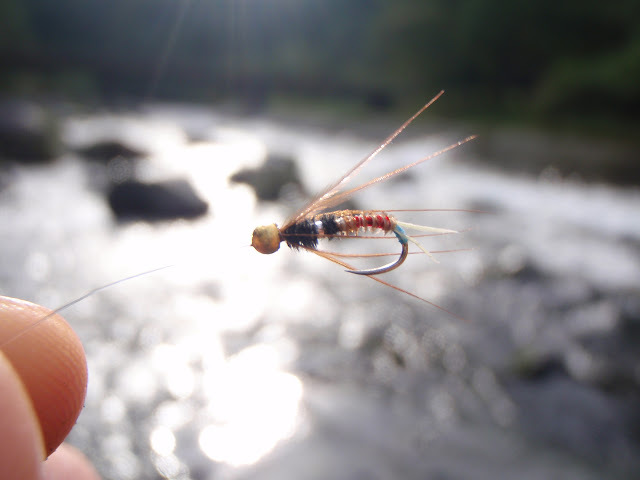 Tenkara flies are not reffered to as ka-bari. This was something I discussed with Mr. Fujioka, who researches tenkara flies, when I was in Japan. He gave me a set of ka-bari, which are used for ayu-fishing because he thought I would be interested, but said ka-bari are not used for tenkara. 2) On the flies, he does mention they are stiff, but we’ll never really know if he was referring to tenkara flies or ayu flies. Here’s an image of an ayu fly. Some ayu flies are stiffer. Likewise, some tenkara flies are stiffer than others. Also, it is more common to see ayu flies made with bristles than tenkara flies. Not an overly important clue, I do not think. 4 Responses to George Elliott Gregory, first mention of tenkara? The image of the Ayu fly mentioned does not appear. The word “Tenkara” only became the word refereed to describe Tenkara as we know today in Japan in the 60’s. Until then, Ke-bari, Ka-bari, nagashi-bari, or what ever it was, were used in different regions of Japan where ever fishing with fly-type method existed for what ever they fished to make a living at the given time. People fished to make a living here, and they’d fish for Ayu when they were in season, and Iwana or Amago and such when they were in season. The modern day Tenkara is understood and differentiated from other traditional fly fishing methods in Japan after such thing as “Angling” or “Sport Fishing” were introduced from the western hemisphere. attached to a line, that was attached to a rod(a stick). 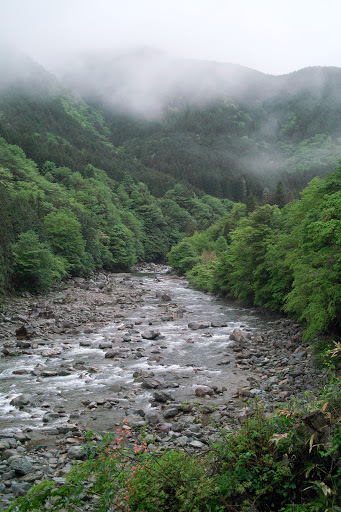 A famous book called “Kurobe Keikoku”about mountaineering and stream climbing in “Kurobe” Mountains of Japan written by “Kanmuri Matsujiro” in the 1920’s describe of his guide, “making rods (most likely bamboo), fishing for Iwana with a “Ke-bari” to provide supper… “They’d visit the remote streams to collect as much Iwana as they can to bring back into town”….. Not a word of Tenkara… But the were “Iwana Fishermen”. Tenkara is as we describe today and still being greatly modified. It should be understood as a method to enjoy fishing for a fish with a rod, line, and a fly and even sometimes with a home-made reel somewhere in between them! The significance is in the goal, maybe not the method. It all dedenps on It all dedenps on were the fish is sitting and how it is feeding,if you are scared you’ll miss the strike, then fish a tiny indicator if possible, the smaller the better and stay away from bright colours. If you think this water is clear check out my other fishing video’s.